Once upon a time, coffee was a major export earner in my country, then it was overtaken by other sectors and is now ranked 4th after horticulture, tea, and tourism. The industry now contributes about 3.2% of Kenya’s foreign exchange earnings, a drop from the 40% contribution in the good years gone by. ..sigh Every morning millions of people get up to a fresh brewed cup of coffee which at times they take for granted –coffee before work, on road trip pit stops, cups brewed out of boredom, coffee dates- each of those cups necessary, effortlessly and immediately accessible. Those cups are products of hours of work, years of patience, decades of struggle for coffee producers and their families. The KEDOVO Coffee Project set out to improve the lives of coffee farming communities in Nyeri , Kenya by connecting the coffee in your cups to these farmers. Farmers like my father, and his father, farmers who grow coffee because it is a way of living, surviving and because it is what their ancestors have left them. Farmers like Kedovo farmer Wilson Mwangi, who struggle to send their children to school in the city and hope they come back with some knowledge to help them survive in the unpredictable future in coffee farming mountains of the Aberdares. Coffee in my country is threatened by drought and climatic change. The coffee Leaf Rust took over most of the farms in the crop year 2016/ 2017. Production dropped to 50%. Most farmers were helpless and felt there would be no solution. My father was no exception and he lost most of his harvest. He had to remove the affected coffee plants appx 300 trees. Growing up these coffee plants put food on our table, by removing them a part of us went away with them…most of the farmers feel the same, a piece of us is gone, because after all, this is their livelihood. This is the way they eat. This is the way they send their kids to school. Almost a year later most of his trees have sprouted, a dark cloud hangs still in his eyes, hes still worried if the Leaf rust will strike again. Kedovo Coffee Project continues to train the farmers especially on comprehensive soil management techniques. Soil fertility is one of the main focuses and the farmers are taught how to protect the soil through shade and how to effectively use “cover crops.” Over the last years, the rain pattern has completely changed. Rain comes at a time when you don’t expect it. Sunshine at time when you should be having rain. We are a worried lot…For the coffee addicts in my adopted country the impact of what is going on in my village will translate to slightly higher bill for a slightly worse cup of coffee. 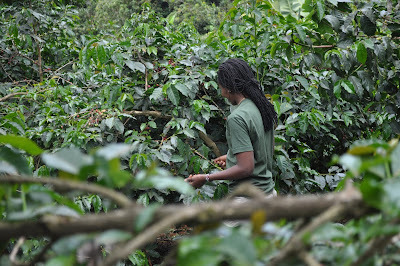 But for my people the consequences will be much more dire… Most of the young people in my village gave up the ''proffession'' of coffee farming to look for work in the bigger cities, experts say the coffee industry is struggling because of this. I sit in my office on a cold winter, all grey outside ...and worry about my people. The plants that put food on our table. This is the pride of my people, their community roots...it cannot be replaced. The Kedovo Project on Sustainable Education continues to support the education requirement of the children of its coffee producers. Many ask me, if you educate them, will they not leave the village? Will you not be faced with the same big problem of migration to cities? Our believe is that if these young people from my village had access to unlimited eduaction chances ,they would finish their degrees, come back to the coffee farms and put their newfound knowledge into practice. What if we in the coffee industry worked hand in hand with them so they can aspire to be producers, like my father and his father, but producers with better Agronomic practices, we trained them to be roasters, give them chances to be exporters and baristas...what if? Can we all vision small coffee farms on the foothills of Mt Kenya, where you could find agronomists, chemists, Exporters ,social workers....the list is long. Would we not rewrite the economics of coffee? By providing better future for these children we will be providong a future for the coffee industry. We finally finished the Adminstration Block of Ndurutu Primary school.This school is 300 Metres from the Ndurutu Wet Mill which is one of the mills under Kedovo Coffee Project. The Adminstration Block was handed over to the community and will also be used as a meeting point for the Board of the Parents Teachers Association who now continues to do monitoring on the school with KEDOVO-Kenya offering advisory services. Ndurutu Primary has currently 160 School kids from Pre-Unit to Class 8. The purpose of the KEDOVO Social Development Projects in the coffee farming communities in Nyeri, is to promote economic development, direct trade and improve the livelihoods of these small-scale coffee farmers, their families and communities.We have long-lasting and trusting relationships with these communities, and our social development support is based on individual community needs. It has been a wild incredibly busy 2017 for the Kedovo Coffee Project. 51 tonnes of green coffee, shipped to Germany. You all are amazing…and thus have helped the KEDOVO Coffee Project to bring together these farmers to work towards a common economic goal. Hope Restored; to the world its a Story book by Kenyan writer Violet Barungi. To the village of my birth its a new beginning for my people. A new beginning in 2016 where hope has been restored, a hope in economical sustainable coffee production and community development. A hope that one day our story will be known to the world. It might take another generation for the coffee producers in my village to fully thrive, but our hope has been restored. An estimated 70% of Kenya's coffee farmers are micro and small-scale producers. Many of these farmers to date are still not able to take care of very basic needs or even cover the cost of school requirements for their children. Our work is to offer technical advice to the coffee farmers so they can improve their production methods to quarantee more yield and better quality. We later on through our partnerships purchase and ship the coffee to Germany via Direct Trade. Farmer's field day- Ndurutu Wet mill Jan 2016 Beginning of January we teamed up with our partners Heinz and Nicole plus a group of other Roasters from Germany and visited the village of my birth.It was a new beginning for both the farmers and our partners whom we have been working together for the last 2 years. Both teams could finally meet the people who produce our coffee to continue forging longterm relationships. Nicole having a discussion with one of our farmers- Wilson Mwangi the Team being taken through Export & warehousing by Maina of KCCE Manuel cupping the best coffees for this season My Name is..... ;) my father with Holger of German Coffee Associatio Farmers & Roasters Meeting- Ndurutu wet mill During the trip we supported Ndurutu Wet Mill with a new Drying bed made of steel. This will ensure that the quality of coffee is maintaned during drying period. The mill has old drying beds made of timber, which have detererioted due to weather conditions and infested with ants. Our work towards community rural development is to support our coffee producers with the necessary tools and resources to improve their lives. welding of the new drying bed preparing the grounds for the new drying bed Zackie of KEDOVO mixing the cement and sand to fix the Drying bed in the ground work in progress HP of Sandtorkai Papenhagen & Davie of KEDOVO handing over the drying bed to chairman Ndurutu Wet mill My Story is the Story of thousands of coffee Producers all over the world and their families Coffee is the only source of income in my village. To us coffee is not just a drink that lands on our breakfast table, ist simply our lives. It provides the economic backbone for thousands of rural communities. These communities are the most vulnerable to coffee crisis due to their location in the coffee supply chain. My village is punctuated by stories of disaster, recovery but above all humour, struggle and renewed hope.I believe that one day our Story will be the Story of how we overcame the struggles and poverty associated with coffee production. I have hope, a hope of a better tomorrow... with my daughter on way to meet coffee farmers in Nyeri During our farmers field day, we emphasized greatly that producing quality coffee and the development of the community was the responsibilty of each and every one of them. We explained to them that what we are creating are conditions that can give them sustainable living, conditions to become entrepreneurs. We might be living an Ocean away but we are them- our relationship makes us stronger. Enjoying a Cup of Ndurutu coffee roasted by Speicherstadt Kaffeerösterie from Hamburg The day would have been incomplete without Barista Zackie @ work ;) Joseph, the Manager at Ndurutu wet mill stressing a Point home one of the farmers looking keenly at Ndurutu coffee from Speicherstadt Kaffeerösterie Zackie of KEDOVO taking the farmers through our model & the idea of Revenue sharing The visit by our Partners would not have been complete without paying a visit to Ndurutu Primary School. For those who follow our journey, they know that my heart bleeds for the children of our coffee Producers. In them i see my Young self and my siblings as my father struggled to put us through School with proceeds derived from coffee production. He struggled, and many are the days we lived on one meal a day as the proceeds werent enough to be divided among his 5 children. My mother hawked vegetables in the village on better days. In those children's eyes i see the unshed tears of a lost hope. And to them i whisper a Hope Restored.... the future of my village lies in their sustainability.....lets give them chances During the visit we kick started our great project for the year Renovation of Ndurutu Primary school. The school has currently 150 pupils with classes of ECD to Class 8. Due to its infrastructure challenges, many of the farmers from the village take their children to Kirichu primary school which is 3km away. By renovating the classrooms, we will ensure that the children of our coffee producers have access to better learning conditions. Conditions that will motivate them to improve their performances and a plus towards the journey of sustainability.Through this we are giving my community chances to rebuild their lives and restore their diginity. This trip was not a Chance for the Roasters to make nice photos of coffee cherries on trees and the poor farmers Standing next to them, it was a trip for everyone involved in our journey to establish and harness the relationships that we have established with our Producers, it was a trip to restore hope in the village where i was Born... Arriving at my old Primary School.... Memories Nicole of Sandtorkai & avie of KEDOVO e.V handing over new books and other stuff to Ndurutu rimary Ulrike of CATUCHO watching her sorroundings in Ndurutu Primary Zackie of KEDOVO showing our Partners the clases targeted in first Phase of Renovations HP of Sandtorkai breathing in fresh mountain air outside the KEDOVO-PAPENHAGEN Library in Ndurutu the gang ;) class 1 Ndurutu Primary- the Phase to be renovated first und los geht's....kick starting the renovations of the school ECD Class in dire Need of renovation This article would be incomplete without the mention of our sincere gratitude to Loppokaffeeexpress. Special thanks to Kira, Axel and the whole team of Loppokaffeeexpress of Kiel in Germany, and their dedication to continue supporting Ndurutu Primary. Through their partnership with KEDOVO e.V they supported the school with reading books as well as 15 full pairs of uniforms for 15 needy children of the coffee producers. Each uniform costs an average of 20€ which is an amount that some of the coffee farmers are unable to raise. The Kenyan education system requires that each school going children compulsory put on an uniform. some of the books supported by Loppokaffeeexpress uniforms for 15 children supported by Loppokafeeexpress the gang getting ready for work in community development @Ndurutu village Davie & Zackie doing what they do best...restoring hope. some of the Kids with their new uniforms In Nov 2014, Kira visited our project in Kenya and she met several farmers and their families. On behalf of my community our sincere gratitude for the continued support. We mainly focus on improving the schools and the lives of the children of our coffee producers so that we can give them chances to better education, chances which on normal circumstances thousands of these children might not have, chances for a better tomorrow, chances which are key in access to employment or entrepreneurship that will help in breaking the cycle of poverty. Chances to dream, chances of a Hope Restored. And we soldier on..... To continue supporting these communities we have on offer Green coffee (Rohkaffee) from Ndurutu Wet Mill late crop 2014-2015 F.O.T Bremen, transport within Germany & the EU arrangable at a cost. Please contact Soni Schneidewind or Nicole Boedgter for information on samples, prices and contract.For roasted Chania coffee kindly purchase from our Online Shop or visit our offices in Kaltenkirchen. Visit the shop & Cafe 'Ein Welt Laden' located at the VHS in Kaltenkirchen , am Kretemoor 40, or pass by at our stand at the Kaltenkirchener Wochenmark every Saturday from 07:00 hrs to 12 noon. I sit and watch as the darkness settle and engulfs the village. Its the last day of 2015. view of the Ranges from my village Its been 2 years now since we fully started trading. Two years of our Social enterpreneurship. Two years of transforming communities through economic development from coffee production. It has not been easy, i have grey hair but no regrets, this is what i wanted to do with my life, this is my world. I know that things might not fully Change during my time, we still have a Long way to go....my People know this too and we will still continue doing what we started. Like any other business we have had a many challenges and we soldiered on. We have met and made amazing friends and partners. The season is coming to an end. The village is still buzzing with excitement as we await the new year. My father says the season has been good, hes very hopeful. His records shows he had 2,150 kgs of cherry and 100kg of Naturals. I still worry. My people though hopeful had a lot of challenges, half of the harvest was destroyed by frost.The season encountered prolonged drought, the rain god didnt visit from the mountains.The last days i have transversed from one range to the other to meet our amazing coffee farmers. Their dedication and hope makes me stronger, They have hope and they know that through our partnership we can together make a difference to their whole lives. Meeting with our Exporters Being a year end we will reflect on the accomplishments, the developments and the challenges that have defined whom we are and the Story of my People. It is all those things that have kept us on the journey--- 1. In 2015 we managed to ship 2 containers of green beans to Germany. The sale of this coffee has greatly supported KEDOVO e.V projects on community development. Without this great Support from Heinz & Nicole, our work would have been so much harder. This purchase benefited thousands of coffee farmers and their families from Nyeri and their communities. This has ensured the intiation of the following sustainable Projects: http://www.kedovo.org/english-home-page/all-kedovo-projects/water-tanks-for-nyeri/ http://www.kedovo.org/english-home-page/all-kedovo-projects/kamamunda-poultry-farming/ http://www.kedovo.org/english-home-page/all-kedovo-projects/flexi-biogas-energy-solutions/ Thank you all of you for the great Support! 2.Through the great partnership with KEDOVO e.V we have met our amazing group of volunteers who dedicated their time and resources to visit, interact and live together with the communities who produce our coffee. Special thanks to Erika Bartels of Kedovo Volunteers who spent a month in the community development program in Ndurutu and later on took it to her heart to support those communities by presenting our projects in Niedersachen, became our greatest ''coffee ambassador'', and through her network brought KEDOVO e.V amazing supporters. Her dedication is a tale of what changes partnerships and cultural exchange can bring to the world. We visited Neema Rescue and Rehabilitation Centre on christmas eve, and supported them with mattreses , blankets etc. We also painted the rooms to make them more cosy and nicer for the children.This would not have been possible without Erika and her friends from Niedersachen and for this we will always be grateful. Asanteni sana! ﻿ the gang purchasing mattresses for Neema children's home at Chaka market ﻿ blankets- supported by Erika & friends in Niedersachen ﻿ the children's room before ﻿ rooms after ﻿ KEDOVO Team , Grace and the children of Neema discussion with Gráce on way forward Through Erika and her work, we was able to Support Ndurutu Primary with several reading books for the School Library built by KEDOVO gang in earlier in July. On top of this, Erika and her Team supported 15 needy School going children with School fees for the whole term! some of the books supported by Erika Banking Slips -School fees for 15 children To those of you near or in Roderbruch, kindly visit Kulturtreff Roderbruch on Rotekreuzstraße 19 on January 24th 2016 from 16- 19 hrs where Erika Bartels will Showcase a presentation about her Volunteerism in Kenya in 2015 as well as the Engagements and work of KEDOVO e.V under the title ''Kenia entdecken''. All are welcome. To our dedicated coffee buyers , without you this would have been so much harder! And your support is greatly appreciated by the community who produce our coffee. 3.Capacity Building We met with farmers and Management of Ndurutu wet mill where we had discussions and emphasized on the cultivation of Quality coffee. Only by improving their Quality will the farmers be able to earn 'real income' from coffee production. We believe by bringing the villagers together to work towards a common economic Goal we will be able to build Long Lasting relationships and partneships and help the farmers have a hope for the future. ﻿ Management Meeting Ndurutu Wet mill ﻿ Chairman- Ndurutu wet mill Farmers representative To all the the People who continue supporting our work, Asanteni Sana! This would have not been possible without you all. To continue supporting the se communities we have on offer Direct Trade Green coffee from Ndurutu wet mill F.O.T Bremen/ Hamburg, Transport within Germany & the EU also arrangable at a cost. Please contact Soni Schneidewind or Nicole Boedtger for Information on samples, Prices and contract. In the Central Highlands of Kenya, many Kilometres from the Indian Ocean, there is a small village called Ndurutu, nestled on the footshills of The Aberdare Mountains , one can see the peaks of the Mt. Kenya to the Northeast, where the folks -before the missionaries came-believed Mwene Nyaga dwelt. On the slopes of this mountain range lies my small , dusty but extremely beautiful village. Ndurutu shopping centre This is the village i still call home- i have lived in many places before, and i finally relocated to Germany after a year of deliberation ( story of another day) and i have done everything to the letter of the book of Migration, but this is where my house is and the village where I was born; this is the place where I played my first games with my friends, swam on the banks of River Chania, and struggled with bags of ripe coffee cherries up the hill. This is where me and my siblings, sat by the fireplace every evening and listened to stories told by my mother, stories that were passed to her by her mother and grandmother.Unfortunately it was not my destiny that I would spend the rest of my life there.....But i live everyday with the memories of it, and the hope that my little contribution can help in changing their lives. a view of the sunset from the village On the 23rd of Sept TG Aphrodite sailed from the port of Mombasa, to brace the high seas, the threat of climatic changes and deliver our second container of coffee for this year to the Port of Bremen on the River Weser. On board is again 250 bags of green coffee from Ndurutu Wet Mill. The sale of this coffee will continue supporting our development Projects in Nyeri, Kenya. meeting ndurutu coffee farmers in jan 2016 with Stefan My people planted coffee ages ago, even before i was born, so being part of a coffee farmer basically begins the minute you are born. I grew up knowing that our only source of income came from harvesting those litlle red berries .My people watered these trees with their sweat and the earth with their own blood, in order to defend themeselves from the politics and the trade that came with every bean that they harvested. across the ridge as seen from Ndurutu wet mill; a small scale coffee farm I have had several people asking me how all this coffee journey began, and whats the motivation behind it. Well this is my story. And its the story of how our journey at KEDOVO e.V began, a story which we want to change for future generations of coffee producers. When i was younger, how did i think about coffee? I left the village when i was 17, I just wanted out. My father was hell bent that i should take the more 'sophsicated and respectable' proffessions, like being a doctor, or a Lawyer- sigh. But i wanted out, out of the village and the struggles and the back breaking toil that came with coffee production and so i left to go and survive. I ''survived'' and i was able to see the world and to learn new things. I went to college and everytime i opened my Economics book and looked at the graphs- i knew what i wanted to become. Moving to Europe, i started thinking of how my people could develop and i realised they had the best opportunity in the world. They grew coffee that unfortunately did not benefit them due to the hurdles involved in the supply chain. They were great coffee producers but not business oriented. Their story needed to be told, but it had to be a story that had hope, a story that was a journey to development, a story that was their story, for i believe its the story of all the coffee Producers all over the world. What they needed was a market that could offer them a good price for their coffee and i believed i could do this. If i could give them this hope again i believed they would produce quality coffee that would be sort after by Roasters from the Western world. This has now become my world, and everytime i roast a bean i remember my folks trying to earn a decent living from a crop that comes with struggles . Everytime i sit at Quijote i worry of their struggles but bast in their determination not to give up in trying to find chances and meanings in a world where decisions made many miles from their village continue changing their lives. with Matt of Quijote roasting Ndurutu AB My idea of Direct Trade and connecting the Roasters in germany with the communities who produce coffee in Nyeri Kenya, is basically an attempt to adress the problem facing the distribution and sale of Green coffee in a much different way than the regulated certifications- note: i have nothing against the various certifictaions out there, only i feel that coffee producers should have more surelty of available market at good prices rather than a promise of a ''future market' if they followed this and that. We should be more focused not only on quantity and social aspects but the overal economic sustainability of these communities at the same time preserving the quality and integrity of coffee, not forgetting that communities develop socially if they are economically empowered. Stefan of Kiez Roastery Berlin meeting some of our farmers The aim of the Kedovo coffee Project is to factor both economic and social development and where we work with these communities from a grassroot level to establish exactly what is required. Kenya like many of the countries in developing world, didnt not meet the set Millenium Development Goals whose term ended in Sept 2015. We now have a long list of the Sustainable Development Goals to battle for the next 15 years. They say to achieve them everyone needs to do their part. - They said Goal 12 aims to ensure sustainable consumption and production patterns, we will do our part- i hope to God the rest of the world does their part... Our story hasnt lost hope and we have had great partners along the journey, people who amazingly continue to support our work both with the purchase of our coffees as well as supporting our many projects on community development in Nyeri Kenya. The last months the gang has been busy winding up the last phase of installing water tanks for water harvesting for a number of our coffee producers, in line with our project for Access to clean water. This would have not been possible without the support of BINGO Projektförderung Schleswig Holstein, for the immense Support , on behalf of my people we will always be grateful. To our Partners Sandtorkai Handel Papenhagen- you have become more than a partner, you are the family that we made in a far away land; the people who believed in us from the beginning, our sincere thanks, and ofcourse to all the amazing Roasters and consumers who purchase both our green and roasted coffees; Asanteni sana! the home of one of our coffee producers who is among the beneficiaries of the water tanks project Wilson & James from Kedovo-Kenya busy with installations 2 hours later.... The gang ;) huraa! we did it The beneficiaries Another beneficiary from last month.... Our Story is a journey of togetherness... and together with the gang we swore to dedicate our time, our resources in making the other children of our coffee producers become self reliant. This we can only do by ensuring they have access and chance to better education facilities. For Kenya to fully develop , its children and especially the ones in the rural farming villages, have to be educated, they Need to have a voice to develop in a world where the Odds have been stacked against them. We at KEDOVO only know too well the struggle to complete education.... Last week the team in Kenya went back to Ndurutu Primary School which is one of the Schools in our Project; Education for Sustainable Development. 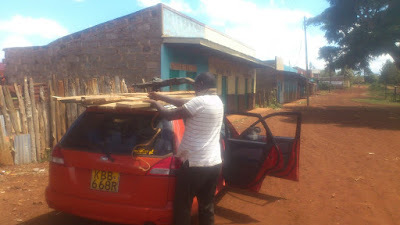 The School's infrastructure like many rural School is in bad shape, and this time the gang delivered School desks for clas 8 who begin their final exams in November. This would not have been possible without the immense Support of Loppokaffeeexpress of Kiel, and for this my since gratitude. Kira and Axel your dedication to Support my community not only through the purchase of their coffee but as well as other social development Projects means the world to me! Davie with std 8 Pupils, the beneficiaries of the new desks together for Ndurutu, thanks Loppokaffeeexpress The gang having a discussion with the chairman ndurutu primary & the deputy head In Progress is also our Project on Renewable energy which is basically the Installation of several Biogas digesters for the coffee farmers in Ndurutu. In many rural Areas, the lack of energy is a key drive of poverty.The sytems are quiet unique in such that they are not the traditional cement Systems that are always in the ground and filled up with manure....this has proven to be very expensive over time and queit hard to maintain or even clean up. We partnered with Flexi Biogas International owned and ran by a great Kenyan guy Dominic Wanjihia. The Project is supported by Centre For International Migration & Development of Germany. The Systems are above the ground and you only need one cow to mainatin the sytem as opposed to the conventional dome shaped Systems where a Minimum of 5 cows is required! currently we have installed 6 Units so far in the village. The Flexi Biogas Systems The digesters use any biodegradable matter be it kitchen waste, market waste, grass etc- but our main source of bio matter is the Coffee Pulp! the Ndurutu wet mill is located in a startegic position that all the farmers have Access to the Pulp that they can use either as organic matter in the coffee fileds- its this that we are now using for the several digesters to produce Biogas! we only Need a bucket of water and a bucket of bio matter daily and thats it. The System will produce gas to cook for upto a Family of 8 without a hitch for six to eight hours. Installations are done within 3 hours for 1 System amd within 7 days the Family is ready to start their new life cooking with biogas.Is this not hope for my coffee community? can you imagine the women coffee farmers not having to trek long distances insearch of firewood? or the Kids running from School at the end of the day so they can go to the forest insearch of firewood before the darkness set? they can now sit comfortably at home and relax or do their homework! is that not the struggle and the hope? We are now able to replace pecious Wood with either cowdung or the coffee Pulp. pulped coffee husks at Ndurutu wet mill I believe there is need for more successive stories of communities who made it- but this is only possible if communities come together and aim towards self reliancy. We now have hope. To continue supporting these communities we have on offer Green coffee (Rohkaffee) from Ndurutu Wet Mill late crop 2013-2014 F.O.T Bremen as well as late crop 2014-2015, transport within Germany & the EU arrangable at a cost. Please contact Soni Schneidewind or Nicole Boedgter for information on samples, prices and contract. For roasted Chania coffee kindly purchase from our Online Shop or visit our offices in Kaltenkirchen. Visit the shop & Cafe 'Ein Welt Laden' located at the VHS in Kaltenkirchen , am Kretemoor 40, or pass by at our stand at the Kaltenkirchener Wochenmark every Saturday from 07:00 hrs to 12 noon.